Our website has moved! Much of the material that was available at the original site has been preserved, but it has been reorganized. 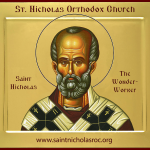 Use the search tool at https://www.stnicholasoc.org, or check the list of links below to navigate to specific pages or topics from the retired website. The Diaconate Boot Camp, hosted by St. Nicholas Orthodox Church, convened May 2 through May 6. If you are interested in attending in 2019, please check for information at www.liturgicalarts.org.